For most of us, a grave provides a place of reflection and peace at the passing of a loved one, but for those who have heroes who are missing in action or were killed in action, there may be no grave or place for reflection on the life of their loved one. 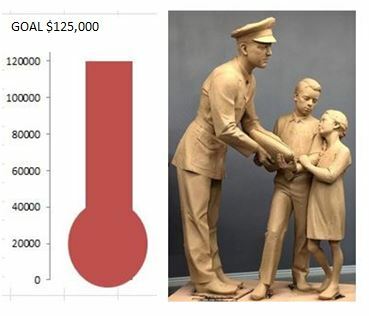 Help us fund the statue by donating now. Help us remember our fallen soldiers by telling their stories. Submit a story about a local veteran below. Blackfoot's American Legion Stewart Hoover Post 23 presented a check to the Bingham County Commissioners to help fund the statue. This brings the total donations by individuals and businesses to $97,000. Patriot Field Memorial Park was built and dedicated in 2016. The nearly two acre park with nine flag poles, walking paths and memorial wall is a tribute to the veterans of Bingham County. The park is located at 355 North Ash in Blackfoot, Idaho. Patriot Field was created to be a place of reflection, an inspiration for freedom, and a legacy for future generations. With the help of local and national records, our historians have compiled a list of individuals from Bingham County, Idaho who have served our nation in the military. We honor them with Patriot Field Memorial. Please search the list of individuals found here, confirm that the information is correct, submit the information for someone who is missing, and share stories of your loved ones who have served. Help us provide a place of solemn reflection for the families of those soldiers who are missing in action or killed in action. ​ Donations can also be made by check, payable to BEDC with a memo indicating it is for Patriot Field. Checks can be dropped off or mailed to: Bingham County Courthouse, ATTN: Clerks Office, 501 N. Maple, Blackfoot 83221. At the center of Patriot Field will be a seven foot bronze statue depicting two young children receiving a folded flag from a military officer. The statue will reflect the ultimate sacrifice for our freedom. The sculptor is Ben Hammond, a renowned artist who was raised in Bingham County.